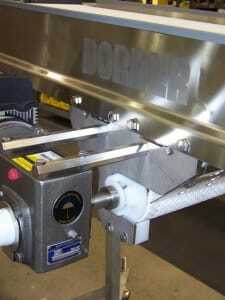 When a customer comes to Dorner looking for a bi-directional modular plastic chain conveyor one basic design is usually recommended a center drive assembly. The basic center drive design simply requires one reversible drive shaft / motor placed in the middle of the belt return way. In addition, a tension roller arrangement is located on each side of the drive at varying locations based on the specific series of belt being used on the bi-directional modular plastic chain conveyor. The center drive method offers several advantages over other bi-directional configurations such as two-motor drive, single motor/slave drive, and one drive push/pull methods. Only one reversing motor is required. Allows additional clearance on ends when needed. Provides excellent operating characteristics because sprocket engagement occurs over 180° of rotation and only one rotating motor. 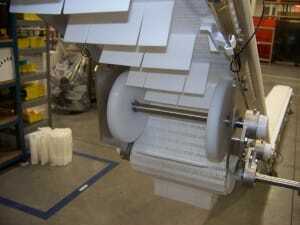 Figures 1 and 2 show two different center drive set-ups for plastic chain conveyors. Figure 2 is especially interesting because cleated chain and/or belt conveyors are rarely used in combination with a center drive. This is due to the nature of a center drive module using three rollers, touching the belt on both sides, to keep the tension and keep the sprockets engaged with the chain. In Figure 2, we were able to use thin UHMW tention rollers with a large diameter on the outsides of the chain to allow the 3″ cleats to pass through the center drive module. Watch the video below to see how it worked.